With the vision of creating the Thailand 4.0, Thai government has introduced the Ministry of Digital Economy and Society (DE) in place of previous Ministry of Information Communications Technology (ICT). 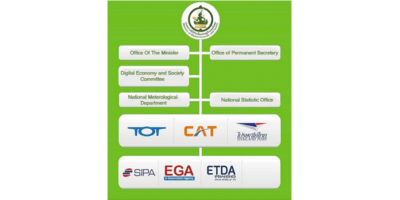 DE Ministry takes over all responsibilities of the ICT Ministry, National Statistics Office, Software Industry Promotion Agency, Electronic Transactions Development Agency, Thai National Meteorological Department and Thailand Post, as well as oversight of state-owned telcos TOT and CAT Telecom. The National Disaster Warning Centre, previously under the supervision of the ICT Ministry, is the only agency that was transferred to the Interior Ministry. This change is brought about as previously ICT Ministry only covered communication technology but not the development of economic and social via digital technology. Therefore, Ministry of Digital Economy and Social is an important entity to encourage both public and private sector to employ digital technology in their operations to achieve the ultimate goal of social stability and economic growth. Raising the country’s competitiveness with digital innovation such that at least 25% of country’s GDP is from digital sector. Creating equal opportunities with information and digital service to ensure that all Thais have access to affordable (less than 2% of income) broadband internet. Revolutionizing government operations for better transparency and effectiveness by using digital technology in all government operations. Since last year, DE Ministry has rolled out multiple projects such the Smart City pilot in Phuket. Together with Financial ministry, Thailand also introduced the first-ever national e-payment, Promptpay, late last year. Minister of Finance Apisak Tantiworawong has remarked that this is the first and crucial step in the nation’s digital finance plan. One notable plan that DE Ministry has introduced is Digital Park Mega Project. The project aims to encourage transfer of knowledge which can lead to Innovation in various areas such as IoT technology and data centre. Digital Park will be located in Sriracha, Chonburi with an area of 240 acres consisting of various zones: Research centres, innovation centres, education institutes, and housing. Companies and start-ups that set up business in the park will receive maximum tax exemption for 8 years and 50% reduction for the next 5 years. Income tax exemption is also given for researchers working in Digital Park to encourage the inflow of foreign skilled labour. What does this mean for IoT industry? Firstly, there will likely to be an increase in adoption of IoT technology in the banking and finance, as well as the manufacturing sectors as the government has provided a range of incentive and aid to help business adopt such technology in terms of both software and hardware. “We will encourage large-scale cloud computing for both the public and private sector,” said Ajarin Pattanapanchai, Senior Executive Investment Advisor with the Thailand Board of Investment (BOI). Secondly, there is likely to be rapid growth in Thailand’s IoT industry due to government effort for both supply and demand side. On supply-side, various government incentives such as Digital Park mentioned above will attract both local and foreign investment into this industry. On demand-side, government has enabled digital literacy education and also made the internet accessible to all. This helps to create a larger market for IoT as more people has the means to use these technologies. In conclusion, the government has put in a lot of efforts to develop a digital economy and allow IoT industry to grow further. It will be exciting times ahead for Thailand’s IoT industry.